It is a tradition among my food blogging friends, especially those dining in and around the San Gabriel Valley, to sip milk tea following late night meals. Chewy tapioca balls are a common add on, but usually my company prefers their drinks straight up and fully caffeinated. While a post-dinner milk tea is perfectly lovely, I’d like to propose a new ritual that’s equally sweet, social, and local: hot fudge sundaes at Twohey’s Restaurant in Alhambra. 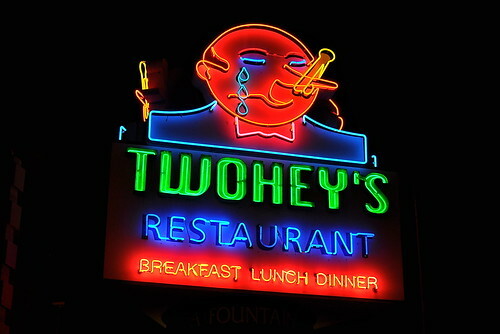 Twohey’s (pronounced “2EE’s”) has been around the San Gabriel Valley since 1943. The restaurant’s symbol, a gentleman with a clothes pin pinching his nose and tears running down his cheeks, is known as “The Little Stinko-O.” It was trademarked by the restaurant’s founder Jack Twohey upon overhearing a woman exclaim, “Oh, Stink-O,” when a patron seated next to her was served a hamburger garnished generously with onions and pickles. True story. The Astronomer and I have driven past Twohey’s florescent-lit “Little Stinko-O” sign hundreds of times over the years, but it wasn’t until Jonathan Gold mentioned the restaurant’s famous hot fudge sundaes in an old column that I had any desire to check it out. 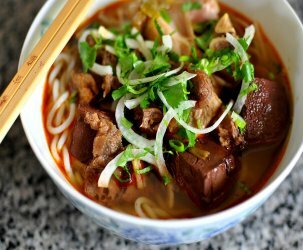 Following last Friday night’s pho feast at Noodle Guy, it was finally time to put my curiosities to rest. The Astronomer and I grabbed two open seats along the Formica counter and placed our order soon after. A “small” sized sundae ($5.45), which came with two scoops of Fosselman’s vanilla ice cream and all the traditional trimmings (whipped cream, roasted almonds, and a cherry on top), was the perfect size for us. 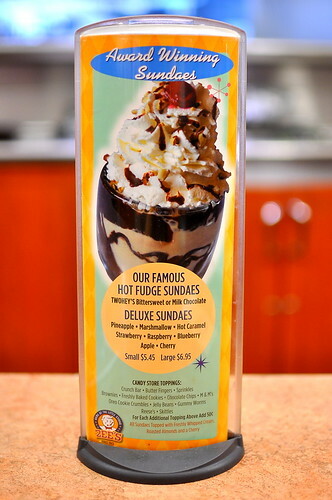 Twohey’s hot fudge sundae made me feel like a kid again. The familiar flavors instantly took me back to childhood birthday parties at Ferrell’s. All that was missing was a self-playing piano and a sundae delivered via a stretcher. The best part was near the bottom of the glass, where the fudge was thick and still hot. I love it when warm fronts and cold fronts collide. Every spoonful was a joy, and we didn’t quit until the glass was scraped clean. This could definitely be a new tradition. Since we moved, we come here altogether too frequently now. LOL. Many a Friday night in high school the biggest decision was: Buster’s or Twohey’s for milkshakes? Great photos, do you still use the D90? 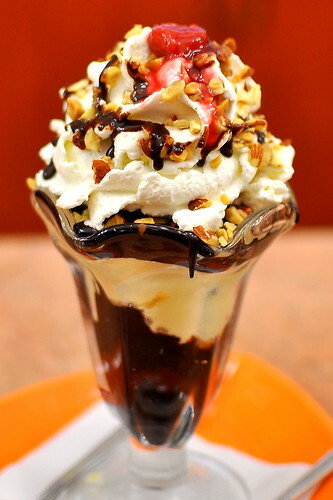 Mm, there is something so perfect about a hot fudge sundae. hot and cold, the salty nuts, and the cherry! It’s all about the cherry for me. I used to get gummy bears on my sundaes as well. Ah, childhood! Justin – We only had Denny’s in my hometown! Would’ve killed for a Twohey’s. And yes, still rocking the D90. 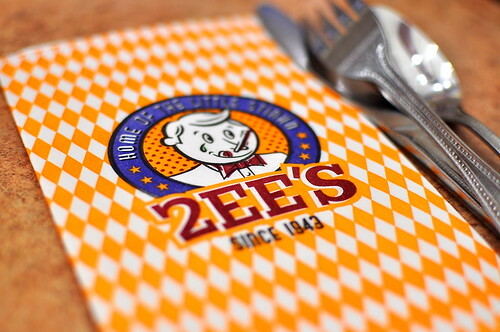 So glad you featured Twohey’s! Been going since I was a little girl, though as a kid I always thought the logo was silly–a snooty looking fellow crying? The oniony aspect of it only made sense ince I was older. Fwiw if you’re ever around Alhambra again I would definitely recommend checking out Top’s Jr (a lot of people prefer original Top’s or The Hat, but I grew up by Top’s Jr so their chili cheese fries and pastrami sandwiches are my bread and butter). 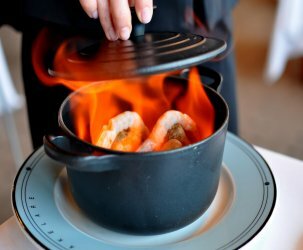 Or if you’re ever in Hollywood, there’s a relatively new French restaurant called Papilles that I found by accident on Valentine’s Day. The strip mall it’s in looks a bit janky, but inside it has a nice ambiance and super delicious food. 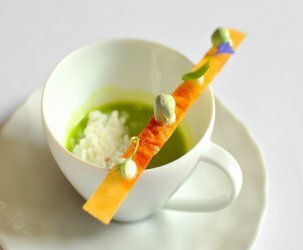 For me personally it beat out The Bazaar as my favorite special meal of 2012! And their banana pot de creme? Oh man. Oh man. Bao – Vernon insisted that I have the cherry—whatta guy! What’s interesting about the cherry was that it wasn’t a traditional maraschino. Instead, it was a sour cherry, like canned cherry pie filling. Ooooo! I wish we had one of those in Chicago! Looks so classically good. That hot fudge is killing me! As I mentioned on Twitter, I live 3 blocks down from Twohey’s. Desserts are definitely the stronghold of the place. Had mixed experiences with the savory stuff but the sweet goodies are always tops. Milk tea nightcap?! What a novel idea! 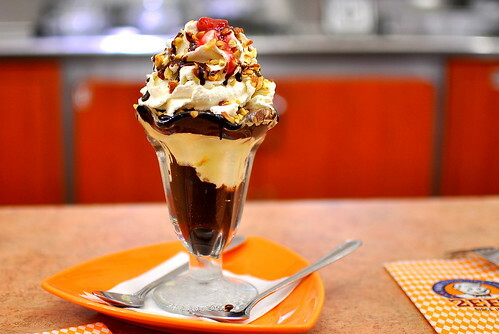 I can’t even remember the last time I had an old fashioned hot fudge sundae! Looks like a stunner. I’d be in for that tradition some time! I grew up going to this spot, so seeing it now warms my heart. I haven’t been in awhile but definitely need to revisit with my parents (who I went with as a kid). Glad you enjoyed yourself! I miss Ferrell’s too, there’s a few still left in SoCal – if you ever want to venture out, tweet me!